Andrew Sayers met Juno Gemes in 2000 at the time of her London Exhibition Where the Sacred Fish Come In and was apparently impressed by the intimacy between photographer and subject. When Gemes suggested an exhibition idea  Portraits from the Movement from her vast photographic archive documenting Aboriginal political struggles  Sayers encouraged her to take the view that she could also tell the story of the Movement itself through portraiture. We are thus able here to re-visit some of the great individuals of our times. Some are well known public figures but many others are far better known in their own communities. All, at one time or another, became her subjects  as they walked, sat, danced or spoke to large gatherings with passion. Their glances are to Juno, not so much at the camera. Yet one senses the hand of history making  that both subjects and photographer are marking their presence at an important and perhaps life changing moment. Juno Gemes came to Australia with her family as a five year old Hungarian refugee. Suffering as an outsider here, she came to identify with indigenous Australians. The living culture of Aboriginal Australia was ignored and kept invisible by the powers within the dominant white culture. The initial impulse and intention of this photographic practice was to make visible the reality of the people from within a true cultural context. The work was produced in conjunction with the communities and individuals represented and is a working participation in the struggle for Justice. I saw powerful beauty,strength,resilience,ingenuity,and hope at a time where others mostly saw only despair, their own discomfort and shame. I saw what had been hidden, kept invisible. Juno Gemes returned to Australia in 1978 and, after a period living and touring with Lardil people on Mornington Island and their dance group Womerah Dancers, she began in earnest to attend functions and demonstrations from about 1982. Attracted to drama, sites of action and beautiful people, she captured the Apmira (Artists for Land rights) exhibitions in Sydney, the Commonwealth Games Brisbane demonstrations, the handback of Uluru, Invasion Day at La Perouse and many others. While some of the best images are of such highly emotive events they are interspersed with deceptively simple group and individual portraits of marvellous characters. Most are atypical, natural, ingenuous. Some warm to the bone, such as the Mornington Island men (Countrymen, 1978) hugging and holding hands  an icon of an image, as is the picture of women dancing (Mutitjulu Womens Ceremony, 1985), forearms held out as if in supplication  giving of themselves at the Uluru handback and showing white Australians a power they might not have cause to witness again. Sometimes it seems possible that Juno's knowing subjects have directed their own presence in the archive. Gary Foley stands at La Perouse on Invasion Day 1988. His back is to the sea from whence came the first invaders  bringing to mind the same means of protest which was later used by Aboriginal people towards the Prime Minister who wouldnt say Sorry. As a fellow traveller in Aboriginal Australia I have witnessed Juno at work  right in the action, up the front, irate at political events or laughing and enjoying the sense of belonging to a shared struggle. At one time dancing with the women (as in the Uluru shot) and then by sheer gall stepping in front of the official party that included the Governor General to face the crowd and whip out her camera. Sometimes she was off balance, barely time to fix a frame, yet she was there. Coming Together - All One Big Mob, 1985, her image of the crowd at the Uluru handback, rewards close inspection  are the security cameras pointed at Juno? As I walked through the present Tent Embassy to the opening in Canberra at the NPG's lovely lakeside gallery a disturbing and contradictory set of memories overtook me. Meeting so many old allies and friends and recalling shared memories of the people and events in the portraits proved nourishing yet we were all aware that the Struggle continues. Those who have gone were very present  Mum Shirl, Bob Maza, Wandjuk Marika, Oodgeroo Noonuccal, Kumantjay Perkins, Burnam Burnam, to name a few. I shared many times with these great Australians and a walk round their images felt like a highly emotional roll calling. I felt flashbacks to the first Embassy  a stern line of Police in front of (old) Parliament House, a surging crowd around me, and the Tent Embassy about to engulf us all. How justly ironic that Parliament House has become the National Portrait Gallery and that this collection of images should grace its walls. Before someone tells me that this might be construed as just a new form of assimilation I must quickly relate that the Australian Institute of Aboriginal and Torres Strait Islander Studies has supported Juno's archival research since 1994 and has her full collection of an astounding 150,000 images. 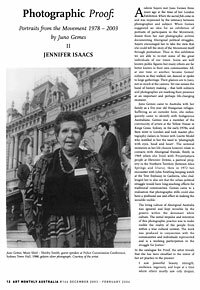 Jennifer Isaacs AM is a writer and curator who has been actively working with Indigenous artists and communities since 1970. © Jennifer Isaacs. Reprinted with kind permission of Art Monthly Australia.